Hand crafted in Macon, Georgia, USA, our smokers, grills, custom trailers and hog cookers are 100% made in America. We use the highest quality materials, and an experienced team dedicated to providing only the best. We strive to provide the most affordable, versatile, and user friendly products on the market! Whether you are a backyard barbequer, competitive pitmaster, professional chef, caterer, or restaurateur... We can help you get delicious, mouth-watering BBQ everytime. 4 Cook racks 22 1/2"x27 1/2"
6 Rack runners configured bottom to top, 5", 5", 3.5", 3.5", 3.5", 3.5"
I am often asked how much fuel I go through when cooking on "Hamlit" (Assassin 28). Well so far today, I am heading into my 22nd hour using 17# of briquettes, cooking at 235 with the waterpan. This thing is amazing! 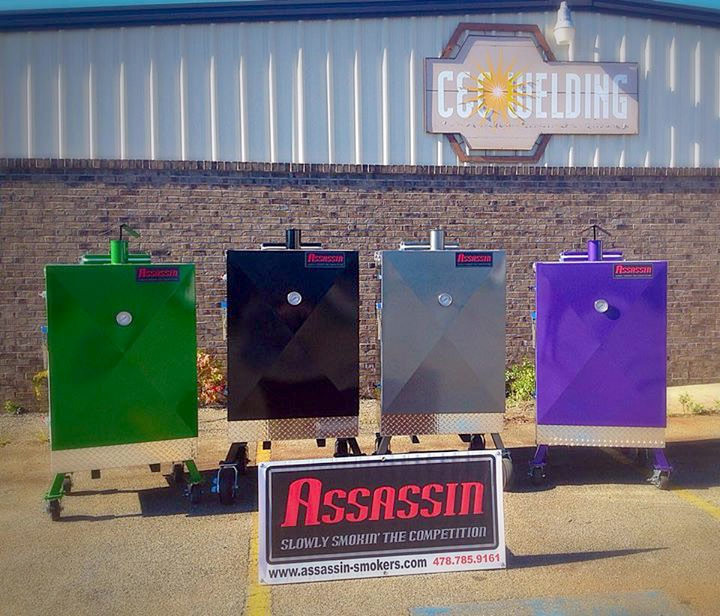 Keep up with the latest products and news from Assassin Smokers and Grills. Subscribe today! C & C Manufacturing, Inc.